It’s been more than six months since I filled a glass bottle with Ketel One vodka, added a vanilla bean split in half, tightened the cap and left it in a cool, dark place – the basement – to infuse. 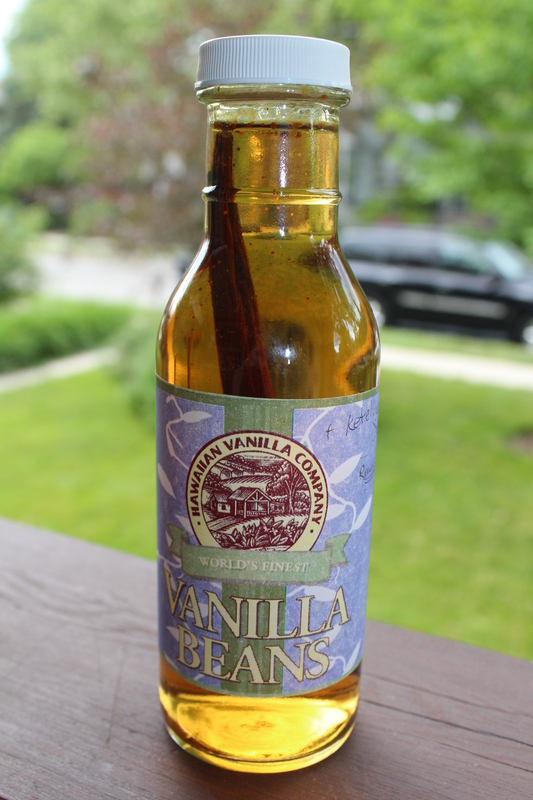 The bottle and bean came from the Hawaiian Vanilla Co., a hilltop plantation on the lush north side of the volcano-scorched Big Island, also known as Hawaii. Keep driving west and you’ll end up in hippie-dippie Kona, gateway to famous coffee plantations. As an aside, when I asked the concierge at the luxurious Fairmont Orchid where to buy great Kona coffee to take home, he suggested Walmart. We had better luck with bags of buttery rich macademia nuts from the tiny Kona Coast Macadamia Nut & Candy Factory. I chose vodka for my extract because it’s supposed to give the cleanest flavour. Rum and brandy also work well, apparently, and the rum-soaked vanilla extract I bought at the beautiful shop does have a deep, rich flavour. According to the instructions that came with the bottle, my homemade vanilla extract should now be ready to use. Time for a taste test! My elixir also has a much fainter vanilla smell, and it tastes like … alcohol. Oh no, looks like I’ve re-invented vanilla vodka! I hope she’s right, since I now own two cups of the stuff. Ina Garten, New York’s Barefood Contessa, recommends infusing 12 beans in a bottle of vodka. Another online article advises using “1/4 cup of vanilla pods” for every half-cup of vodka. With a $29.95 bottle of vodka and beans costing at least $7 each, you could easily spend a fortune on this DIY project. Guy Russel, CEO of Zeron Fine Foods in Markham, which sells Double Intensity vanilla extract, laughed when I told him my story. Turns out he once soaked vanilla beans in vodka, with the same unsatisfactory result. By law, pure vanilla extract must contain 100 grams of vanilla beans (which he sells for $30) for every litre of 35% alcohol. He says companies shred the beans with a special machine and circulate water and alcohol through this mash for a day or two to create extract. “Just marinating beans in alcohol doesn’t do the same thing,” he said. By the way, there’s a reason vanilla is so expensive. The flower of the vanilla planifolia orchid – a vine with rubbery leaves often found snaking around trees – blooms just one day a year, for only four hours. During this brief window, each pale, scentless bloom is pollinated by hand. The plants don’t all bloom at once, fortunately, but over about two months. Nine months after pollination, the flowers produce long green beans, ready to be picked and cured to develop their flavour and colour. Curing can take another three to six months. I’ve always loved Zeron’s Double Intensity Pure Veracruz Vanilla Extract, from Mexican beans. Last year, Russel launched Double Intensity Tahitian Vanilla Extract, made from plump vanilla tahitensis beans, prized for their full, fruity flavour. It’s available at Pusateri’s and McEwan’s, or online at www.zeronfinefoods.com. Though you may fall off your chair at the price, it almost feels like a bargain when you consider the price of vodka and a fistful of beans. I make my own. Load 40-60 beans (chopped up) and a 750mL bottle of rum or vodka in a jam jar. Leave it on the stove where it can get a little warm from the oven but NOT hot. Shake jar once a month for 6 months. BEST vanilla ever.